Contrary to popular belief, learning how to knit doesn't have to be a difficult task. You just need a really good book that shows you how it's done, and you'll be well on your way to mastering the art of knitting. 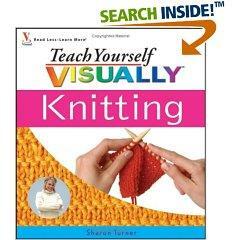 Sharon Turner, author of Teach Yourself VISUALLY Knitting and Teach Yourself VISUALLY Knitting Design: Working from a Master Pattern to Fashion Your Own Knits, believes that anyone can learn to knit-even those who don't consider themselves "crafty" people. 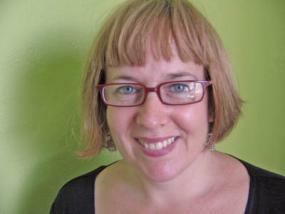 In fact, she runs two weekly after school knitting clubs for children and teenagers in New York City schools. Once you've learned a few basic knitting techniques, you don't have to be limited to creating blankets and scarves. 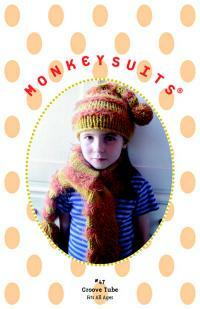 If you're interested in trendy and fashionable knitting projects, check out Monkeysuits, Sharon's line of knitting patterns for children's clothing. Sharon is also releasing Find Your Style and Knit It Too, a knitting guide for teenagers and young adults featuring fun projects like skull wristbands and an iPod cozy, in October 2007. Monkeysuits knitting patterns are playful and fun. Recently, Sharon took some time out of her busy schedule to answer a few questions for the readers of LoveToKnow Crafts. How did you first become interested in knitting? I don't remember exactly how, but I do remember knitting dresses that were basically garter stitch tubes for my Barbie dolls and Troll dolls when I was 8 or 9 years old. After that I don't remember knitting again until I was in art school; it was a great way to relieve stress. At that point, I didn't knit actual garments--I just had a big rectangular piece of knitting that I worked on as a sort of therapy. I became a true knitting addict when I was pregnant with my first child. Knitting for babies is the best. You can channel all of that excitement and love into an adorable little sweater or booties. What is your favorite part of the knitting process? I have to say that the planning and buying yarn stage is the most exciting--the feeling of potential is so strong. I also love getting up to my elbows in color and fiber when I'm designing a new project. How would you describe your own knitting style? What types of projects do you most enjoy? I like to alternate from one style to another, and I like all kinds of projects: big projects like sweaters and coats, small projects like mittens, hats, and socks, easy projects in fat yarn, and more complex projects involving cables and color work. For knitting at the park after school, it's nice to have an easy project that doesn't require a lot of concentration so I can chat with the other moms. Usually after I finish an intricate Fair Isle project, I like to switch to something easy in one or two colors. I guess if I had to choose my favorite type of project, I would say something in soft wool involving lots of cables. What advice would you give to someone who is interested in learning how to knit? Become close friends with an expert knitter! So many questions come up when you're beginning, and sometimes it's hard to understand if the help is coming via email or over the phone. A helpful yarn store owner or employee is a great ally also. If neither of these is within reach, a comprehensive how-to book that includes lots of photos and illustrations, and that has an extensive "fixing mistakes" section is the next best thing. What's the most common mistake that a beginning knitter makes? Trying to knit a pattern with yarn that doesn't knit to the same gauge as the pattern. It's almost as if every knitter has to go through the experience of falling in love with a design and then knitting it to the wrong gauge to learn how important gauge really is. I know I fell victim to that years ago, and ended up with an expensive sweater that had a neck opening about a foot wide. Is it true that it's harder for left handed people to learn how to knit? Absolutely not. I'm right handed and I knit with my left hand using the Continental method. I have taught both lefties and righties with equal success. The problem is that many how-to books favor the English method, and lefties think that you have to be right handed to do it. I recommend that students eventually try to learn both the Continental and the English method so that they can do two-handed color knitting. Sometimes when my carpal tunnel syndrome flares up, I switch to the English method. I'm happy to be able to do both. How difficult is it to teach a child to knit? How can I tell if my son or daughter is ready to learn the basics of this craft? There are exceptions of course, but my experience has been that, in general, eight years old is an excellent age to begin. I teach an after school knitting club at my two younger daughters' school. For the first session, I included a few second graders in the class, and felt terrible about it afterward. It was so difficult for them to manage holding the yarn and needles that it wasn't even fun for them. I also think it's terrible to try to get kids to do things they're not developmentally ready for; they just feel like they have failed. Handmade knitted items have a timeless appeal. When one of the same kids came back to knitting club in fourth grade, it was a breeze. Also, being able to read well helps if they want to advance quickly to knitting something from a pattern. On the other hand, while my older daughter didn't want to knit until third grade, my middle daughter learned how to knit quite easily when she was in first grade. Kids who have good hand-eye coordination, the ability to stay focused on a task for long periods of time, and who are just aching to knit-regardless of their age-are good candidates for a beginner lesson. In your opinion, how has the public's perception of knitters changed in recent years? Do you think celebrities who have popularized knitting as a "cool" hobby have contributed to an increased interest in the craft? A friend of mine described knitting as "geezerly" about 15 years ago. Now it's quite hip to knit. I live in New York and I have seen 20-something men knitting on the subway. I don't pay attention to what's going on with celebrities, so I'm not sure how much of an impact they have had on the perception of knitting changing from grandmotherly to cool. Someone I know who owned a knitting store for many years said that interest in knitting is cyclical, and that interest peaks every 20 or so years, making knitting popular to lots of people of all ages. I noticed a big surge in the popularity of knitting a couple months after the events of September 11, 2001. Yarn stores started ordering patterns like crazy that fall. I know that I went around in a state of shock for a while; everything seemed trivial. The first leisure activity that struck me as appealing or meaningful was knitting a sweater for my baby due that November. In a world where chain stores abound and clothes are mass-produced cheaply, a hand-knit sweater is rather special. If you've been thinking about taking up this hobby, there's no reason to wait, Choose your book or sign up for a class at your local craft or yarn store, and start knitting whatever you want to create.